Thirteen years ago, I stumbled into a job working part time for an established and innovative Pop Art dealer named Stuart Bird. Stuart was originally from Oklahoma and of Native American descent. (Cherokee.) He was proud of his heritage but never in a boisterous or lecturing way. He was simply proud of being Native and also proud to be an American. Every morning, coming into work at his home office, I would smell the nag champa incense he burned in the kitchen and I was always greeted by Stuart’s two dogs Yogi and Boo Boo, two cats, two parrots and Big Red, the fish. Stuart hired me though I did not have an extensive background in art, just love for this art world. As he ran out the door on my first day at work I remember him telling me to “Read, read, read.” He meant the many art books in his shelves, many with a focus on Andy Warhol’s life and works. Stuart Bird was a genuine expert on all things Andy Warhol and was considered by many colleagues to be the best art salesman they’d ever encountered. I am very lucky to have gained my education under his guidance. To me, he was the best. Around 2005, Stuart returned from his first visit to the Warhol Foundation and he was like a kid in a candy store. He came with several Sitting Bull prints in his possession and when I arrived at work, he had the prints proudly displayed on the living room table. They were arresting and beautiful. The image was originally created by Warhol as part of the Cowboys and Indians series but Warhol decided against including them at the last minute. 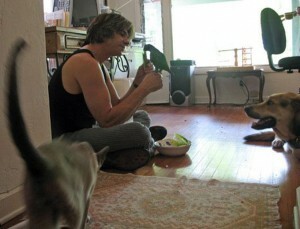 They were set aside for years under the care of the Foundation after his death. With Stuart’s visit, they were now seeing the light of day. 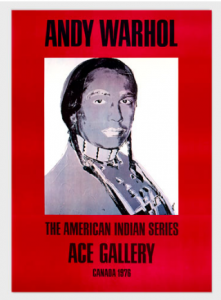 It was at that moment, while standing around the table admiring Sitting Bull, that Stuart Bird told me of Andy Warhol’s interest in Native American art. 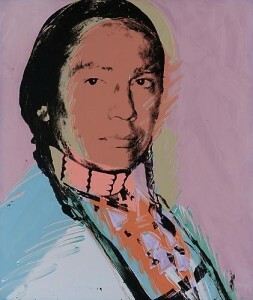 I had not known until then that Andy Warhol felt a very personal connection to Native American culture and traditions. I suspect it was part of Stuart’s abiding love for Warhol. 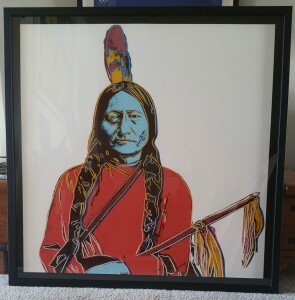 Andy Warhol, Sitting Bull, framed. 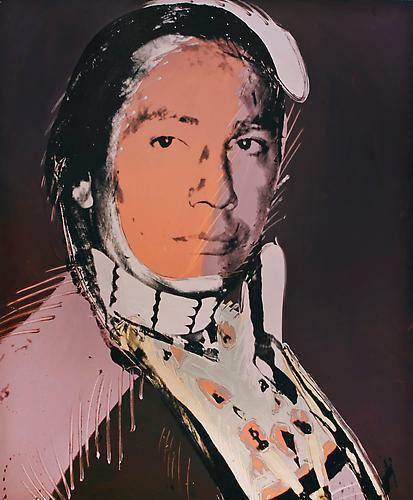 In the 70s, Warhol made a series of paintings and drawings of the Native American actor and activist Russell Means. Taken from publicity shots, Warhol exaggerated and glamorized Mean’s features while maintaining dignified and majestic portraits. After Andy Warhol’s death in 1987, 57 native American blankets were found at his residence, as well as a variety of rare woven baskets and photos of Native Americans by American photographer Edward S. Curtis. 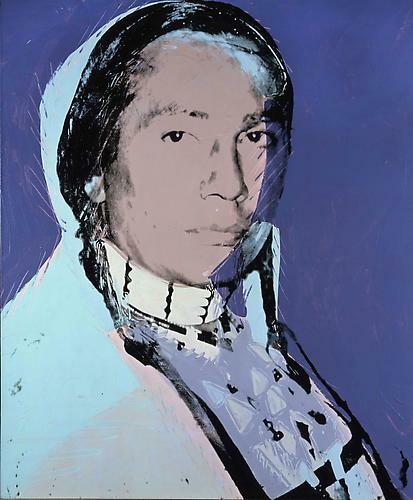 Warhol clearly had a curiosity and appreciation for the history and culture of Native Americans. 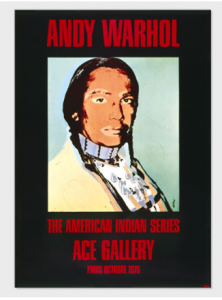 It is a rich and fascinating cultural universe that all of us can and should explore, just as Warhol did. 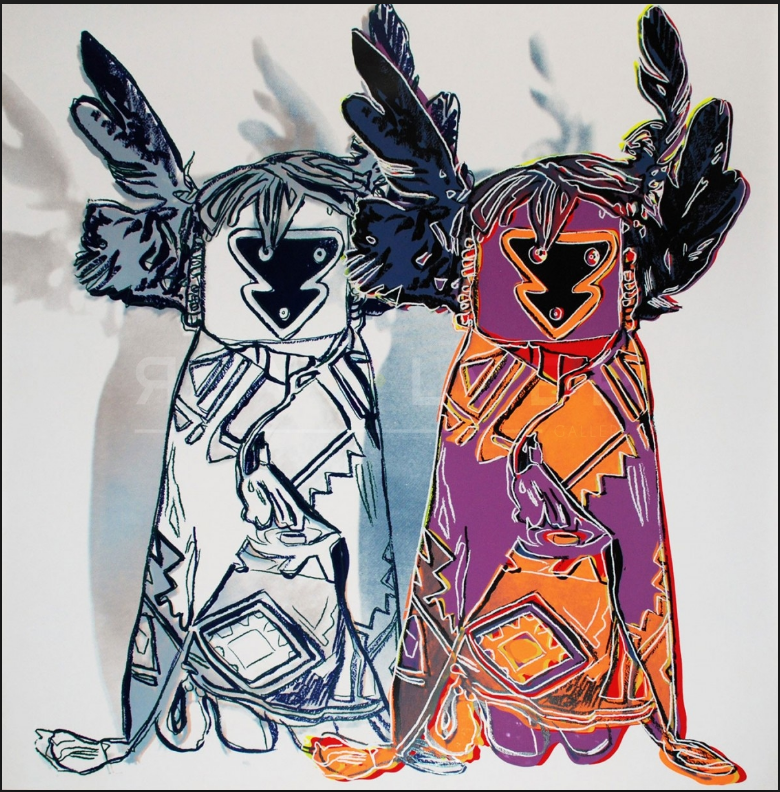 For me, seeing Stuart Bird’s strong personal bond with his own heritage and his profound love for Warhol and his myriad creations was a moment of understanding that brought a smile to my face. It’s not everyday that this kind of interrelatedness is revealed in the world of work or even art. But it was both. Sitting Bull is one of Warhol’s most beautiful pieces and it is an amazing piece for anyone to have in their collection. 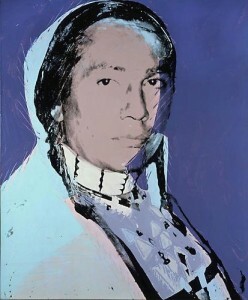 For information about Sitting Bull or any Andy Warhol prints, contact us. The Ace Gallery exhibition poster with Means’ image has become a popular collectible item and they are signed by the artists. Contact us for more details. 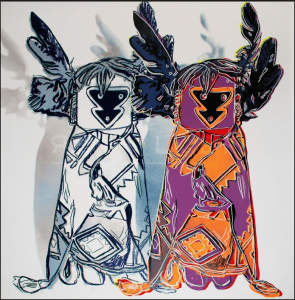 Lithograph, Screenprint, Etching. Do You Know Your Art Print? Art for Sale Online. Buying Art, the Internet and ebay.